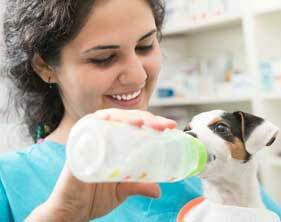 When your pets need pet medication, a compounding pharmacy is usually first on your veterinarians list. Veterinarians do not have access to the wide variety of commercial pharmaceuticals that a human medical doctor would have. It is quite common for veterinarians to have their medications compounded in order to meet the medical needs of each animal that they are tending to, to address specific dosing needs. Irvine Compounding Pharmacy helps veterinarians solve these problems by offering customized solutions for their pet medication dosing dilemmas. Various Nausea/Blood Pressure/Cardiac/Cancer/Mood Disorder medications in topical or oral suspension or capsule. Our trained pharmacists work with dozens of veterinarians throughout Orange County and are ready to work directly with your veterinarian to provide a custom pet medication providing specifically the pet medication your veterinarian prescribes. If your veterinarian prescribes custom medications, a compounding pharmacy is the only place that will be able to fill your prescription for your custom pet medication. Your veterinarian will want to follow up to determine the results of the prescription written and may alter the amounts of the custom veterinary medicines used, based on the results your pet experiences.